The Friends of the Flange : Let's get tanked. One warm night, some twenty years ago, my family detoured for a quick stop by the tracks before getting back to the house and going to bed. The little patch of grass we had claimed as our own train-watching turf saw a lot of action from the mainline and from a scrapyard and a brick factory a few blocks down, and we stopped there frequently. The train came barreling in, highballing out of Fort Worth, and the ground beneath our feet convulsed. I don’t remember whether the driver gave us a friendly salutation, or how many engines headed the train, nor the makeup of the consist, but on this particular night, something happened that I never forgot. 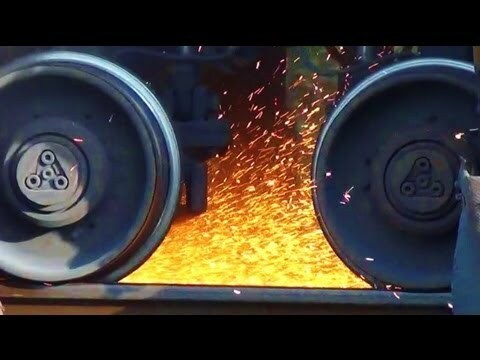 Midway through the train, a tank car with a stuck wheel came sparking and screeching its way down the tracks--what I now assume must have a 'hot box,’ though I didn’t know the term back then. There was no delight in seeing part of the train lit up like a sparkler. I feared that the crew was unaware of the problem since the train didn’t appear to be slowing and that it might derail somewhere down the line. It was a transformative moment in which it dawned on me that even if a train was pleasant to watch and listen to as it passed by, it carried with it a multitude of dangers. This incident also struck a fearful nerve in me because I was also old enough to have an inkling that whatever was being inside those tank cars was hazardous to my health, and would become much more so if it came in contact with heat or fire. Ever since then, seeing a train of tank cars, or even just a few of them tucked in between box cars and flat beds, sets me on edge. I get these little shivers fairly often, now that I live in a house a bit farther down those same tracks, where I can look out my bedroom window and watch the trains roll by. They carry acidic chemicals, food-grade oils, crude petroleum, liquid fertilizers, ethanol, and molten sulfur. I’d estimate that a good quarter of the traffic going past my house is made up of tank cars, and in the northern United States and Canada, the majority or almost the entirety of rail traffic may be liquid goods. Of these tank cars, the majority of them are of a design known as a DOT-111: Unpressurized, up to about 35,000 gallons in capacity, and with walls that are, at their thinnest, less than an inch thick. DOT-111s as you don't want to see them. Around this same time that I witnessed the hot box, some professionals in the industry and members of regulating authorities began to articulate more informed versions of my childhood worry. In May 1991, the National Transportation Safety Board issued a study voicing concerns that the DOT-111‘s relatively thin walls made them prone to rupturing. They were vindicated in 1992, after derailment in Superior, Wisconsin, but regulations were not adjusted to reflect the potential danger posed by these railcars. Fast forward to the early 2000s. By 2010, the hydraulic fracturing industry had turned the energy industry on its head, and more oil was taken out of wells in the US. and Canada. While public opposition mainly focused on the pollution caused by fracturing wells and the earthquakes that resulted, and the potential for leaks out of pipelines, there was less scrutiny on what happened to these materials after they were taken out of the ground. Crude oil and natural gas require refining and processing, sometimes at locations quite a distance away from where they were extracted. The Class I railroads stepped up to the challenge of moving those vast quantities of raw materials when they suddenly appeared--in fact, it helped the industry pull out of the Great Recession. The number of DOT-111s on the rails increased dramatically to keep pace with demand, and many tracks close to oilfields were, and still are, filled to capacity. This level of congestion, and the hazardous cargo carried on the trains, left little room for error. The boom in crude oil translated into a dramatic uptick in accidents. In 2013, more crude oil was spilled from railcars than in all other decades before combined, and 2013 and the early part of 2014 both saw a number of cases where the hazardous cargo caught fire or exploded after leaking from the puncture-prone DOT-111s. The most horrific incident was the Lac-Magantic disaster, where 47 people and most of a town were incinerated by a runaway oil train. The most obvious answer is to order the DOT-111s off of the rails, and replaced with tank cars better designed to retain their integrity during a crash. In fact, news hit my feeds a few hours before this article that the Canadian government had, in fact, ordered DOT-111s to be phased out. The NTSB has again criticized the continued use of these vessels,but seeing any legislation of this sort is probably a remote possibility in the United States, though--there have been no changes in industrial regulations after the West, Texas fertilizer explosion, and the current stagnant and over-moneyed Congress would not be likely to put drastic restrictions on a major industry. Local and state governments generally do not have the ability to enact laws regarding the behavior of the railroads, due to the Interstate Commerce Laws. Just as important as redesigned rolling stock, in my opinion, is the condition of the tracks themselves. Proper upkeep of the right-of-way can prevent some derailments before they even happen, especially during a difficult winter such as that in 2014. This, too, would likely require more stringent legislation, or at least a reexamination and better enforcement of the laws already on the books. Another issue that seems to come up a lot in the reporting of these incidents is that first responders cannot tell the contents of some tank cars by looking at them, and may have extreme difficulty obtaining this crucial information from the railroad companies. It is essential information, as not all fires will respond to the same kind of extinguishing materials. (Some will even explode if they are doused with water.) The railroad companies and regulating boards must find a way to make this information available in the case of an emergency, yet not obvious enough to present a security risk. Finishing up this article, I can hear the rumble of an approaching train off in the distance. It occurs to me that in all the years I have lived next to these tracks, I have never witnessed a major incident--probably 99.9% of the cargo arrives safely at its destination. It’s the threat of that .01% that lingers in the back of my mind. Serious accidents may be rare, when measured against the sheer volume of rail traffic, but we have no excuse for not attempting to reduce the number and severity of incidents that do happen as much as is humanly possible. Edit: Within a week of writing this post, we had another dramatic oil train derailment in Virginia. *Before anyone shouts “Pipeline!”: Even if an oil pipeline were to be built tomorrow, some hazardous cargo would still ship over the rails, in the same kind of railcars, so I believe these issues need to be addressed regardless of how crude oil is shipped in the future.